"These people make their appearance here once a year. Where or how they live nobody knows." They continued coming for another 4 to 5 years until 1959, then they disappeared. 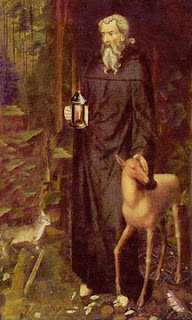 In various discussions at the time, it was said that the hermit was a certain Metropolitan from the district of Peloponnesos who after resigning from his office and position, came to the Jordan River to live as an ascetic, near the hermitage of the venerable Mary of Egypt, together with the two nuns. The next year, in 1955, I remember that Deacon Chrysostomos said to His Eminence Benediktos that he wanted to follow the three hermits, to see where they go after they receive the Holy Light. Indeed he received the blessing of His Eminence, who had not yet become Patriarch, and he waited in the tower to see the cleric with the lit lantern, as was his custom. Indeed the hermit arrived with the two nuns in the middle of the courtyard and Deacon Chrysostomos ran to reach them. They swiftly passed through the door of the venerable Mary of Egypt. When the deacon arrived there, neither to the right nor to the left nor straight ahead did he see where they went. Nobody knows where they went or where exactly they live in asceticism. After 1959 they no longer came. It appears they fell asleep in the Lord. Source: From Ο Όσιος Γρηγόριος, No. 12, 1987. Translated by John Sanidopoulos.